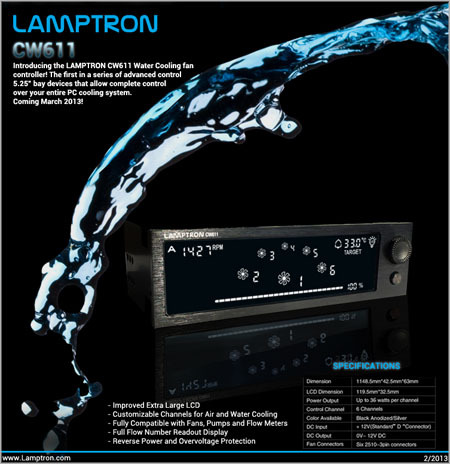 Introducing the Lamptron CW611 Water Cooling fan controller! The first in a series of advanced control 5.25″ bay devices that allow complete control over your entire PC cooling system. 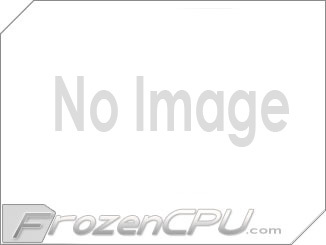 You can use this controller to be used with fans, liquid cooling pumps, as well as flow meters. The first in a new series of controllers this is sure to get all the information right at your finger tips! This first entry is based off the FC Touch with some board modifications. Note: Fan and Power cables are factory sleeved black / black. Easy to install and setup. Nice vibrant screen. Temps +-1 degree off but not too bad. The name says it all Lamptron it''s by far the best fan , pump, lighting controller I''ve owned plus I got the fast shipping from FrozenCPU.com can''t go wrong with this one just awesome.. This is prolly the best controller ever made in the market if I don''t look at it''s price tag. The 2x control buttons are low profile so they are not sticking out too much to keep front panel flush and clean. The LCD lights are dim-adjustable to "completely off" while maintaining the unit running according to user''s pre-arrangements. The overall built quality is pretty and solid. Very nice metal front plate and all cables are black-out and sleeved for easy hideout purpose. There are 6 programmable channels that can be setup for either water pump speed controls, fan speed controls, or flow meter readings, but I wish Lamptron can add the "case light controlling" icon as the 4th function in the future so this unit will become truly universal. One suggestion I have to make this unit even better is about its wire management in the back side. Currently all 6 connectors are located at the back-upper portion of the unit and causing a messy look of because the hanging loose wires. I suggest rearranging the ports to lower portion of the unit or some clamping mechanism (hooks/loops/clamp-rails built into the frame??) that allows securing the wires and keep a cleaner look in the back. I am sure people with an open side window care a lot!! The only short fall for this unit is about it temperature read outs. It is a common flaw to most of the control units in the market. Knowing the "temperature" is the key concern to most of PC-DIY geeks, and just like many other controllers that this unit only allows displaying one temperature per screen. It will be ideal to display all channels but causing messy look of the screen, and I suggest allowing of displaying two full-time readings (in & out) should be good enough. I can live with it as-is... and I do believe it is the best control unit so far in the market. 1 and up $69.99 ea.